(Rome) Next October 19, an elite study conference between members of the Catholic Church and Freemasonry will take place in a medieval castle near the central Italian city of Gubbio, now a luxury hotel. Specifically, with the open letter "Dear Brother Freemasons", which Cardinal Ravasi published on 14 February 2016 in the Italian business paper Il Sole 24 Ore, declaring himself “more prepared to dialogue and more open to different positions.” Overall, Freemasonry shows amazing satisfaction about the administration of Pope Francis, who is mentioned in the diocesesan statement (see The Bishop "Very close" to the Pope Congratulates the Masons). These include more recent attempts at "dialogue". First attempts of this kind came after the Second Vatican Council, especially in the 70s. For the Church, membership in the Church of Jesus Christ and membership in a Masonic Lodge is considered incompatible. The Bishop of Assisi is Msgr. Domenico Sorrentino, who was secretary of the Roman Congregation for Divine Worship and the Order of the Sacraments from 2000 to 2005 (Pope Francis' Mysterious Liturgy Commission). The Catholic Church is not represented in Gubio, but a certain part of the Church. Among the speakers is a pastor of the Waldenses. Their origin dates back to the High Middle Ages. Since the 16th century, however, Italian Calvinism is actually forming. Especially in Piedmont, but also in Tuscany, the Waldenses have traditionally had close ties with Freemasonry. The press release of the diocese of Assisi uses the term "church" for the Waldenses. According to the doctrine of the Church, as it is written down in the catechism of the Catholic Church, only those communities that have apostolic succession have a share in the Church of Christ, which was never the case for the Waldenses. 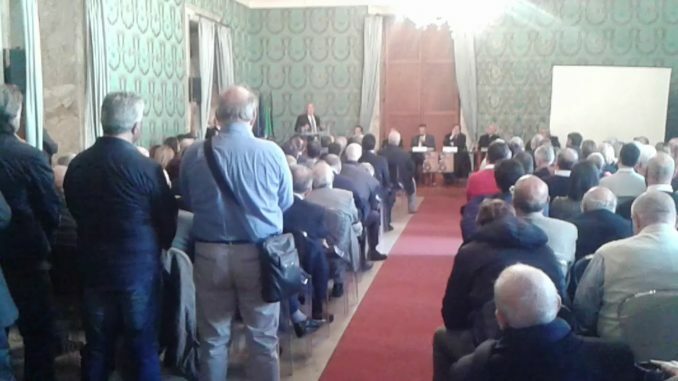 Other speakers include the Catholic priest, Don Gianni Giacomelli, prior of the Camaldolese monastery Fonte Avellana; the Grand Master of the Grand Orient of Italy, Stefano Bisi and the President of the College of the Reverend Masters of the Masonic Lodges of Umbria, Luca Nicola Castiglione. The conference's motto is: "Church and Freemasonry: Is Dialogue Possible?" Organizer of the meeting is the Association of Catholic Workers ACLI in the Catholic Action. 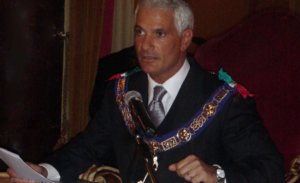 But the final word will be Stefano Bisi’s, Grand Master of the Grand Orient, Italy's most influential freemasonry. 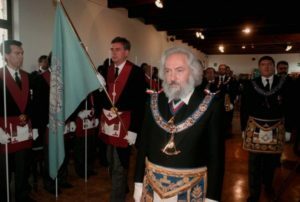 (Buenos Aires) An Argentinian bishop and Jesuit congratulated the Masonic lodge of his episcopal city upon its founding. The event itself is spectacular. The bishop, however, is not just any ordinary. Congratulation of the bishop: "Keep working in the service of humanity and universal brotherhood. The Bishop of Lomas de Zamora, Msgr. 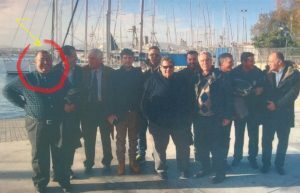 Jorge Rubén Lugones, sent to the Masonic Lodge "Giuseppe Mazzini" No. 118 his "congratulations" on the 126th anniversary of its founding. 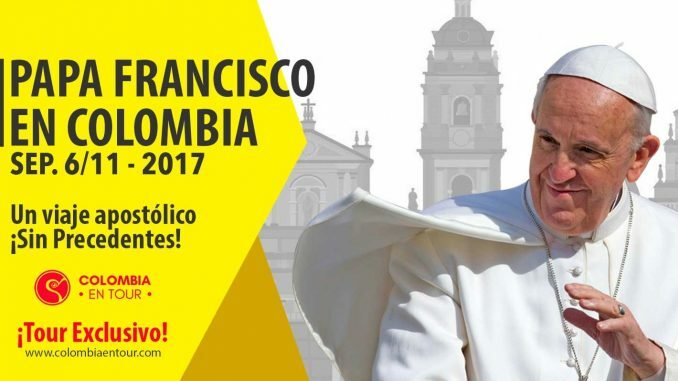 "Today we received this greeting from the diocese of Lomas de Zamora. We publicly thank you for the reverence and reaffirm our commitment to work together for greater freedom, equality and fraternity by setting aside anachronistic differences. " By "anachronistic differences" is meant the ecclesiastical prohibition of the lodge membership for Catholics. Since the founding of Freemasonry 300 years ago, the Church has been teaching its incompatibility with the Catholic faith because of its grave, ideological differences. Who is Bishop Jorge Rubén Lugones? The 66-year-old bishop was born in the state of Buenos Aires. In 1999, Pope John Paul II appointed him Bishop of Nueva Orèn. He was consecrated by Jorge Mario Bergoglio, then Archbishop of Buenos Aires. Since 2008 he has been Bishop of Lomas de Zamora. At the Argentine Episcopal Conference he is a member of the Commission for the Pastoral Care of Indians and for the Commission for Social Affairs. The journalist Sergio Rubin, longtime confidant and first biographer of the current Pope, described Jorge Rubén Lugones as "close to the pope" in the Argentine daily Clarin last June. "Freemasonry is an initiate, esoteric, elitist, and knightly order that seeks to develop the ethical, moral, and spiritual enrichment of its members." "Faith in a God whom it calls the Great Builder of the Universe, along with love, service to humanity and universal brotherhood, forms the foundations of our system." According to the lodge's website, the Masonic "system" means "an educational, philosophical, traditional and symbolic system", "seeking knowledge to reach the truth". However, this "truth" does not mean the Christian truth, or more precisely, the truth personified in Jesus Christ ("I am the truth") in the Christian understanding. Rather, Freemasonry was founded precisely because it rejects the Christian (divine) offer of truth, and instead seeks a hidden truth independently of it. "It does not prohibit or impose a religious belief or practice on its members." The question was raised as to whether the Church's judgment on Freemasonry has changed due to the fact that the new CIC does not explicitly mention it as the earlier one. This Congregation is able to answer that this fact is based on the same editorial criterion as for other associations, which were also not mentioned, because they are integrated into broader categories. 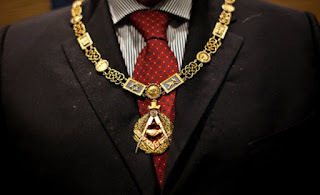 The Church's negative verdict on Masonic unions remains unchanged because its principles have always been considered inconsistent with the doctrine of the Church, and therefore its membership in them is prohibited. Believers belonging to Masonic associations are thus in a state of grave sin and can not receive Holy Communion. Authorities of the local Church are not entitled to comment on the nature of Masonic unions in a judgment overriding the above, in accordance with the declaration of this Congregation of 17 February 1981 (see AAS 73/1981; Pp. 240-241). Pope John Paul II confirmed this declaration, which was adopted at the ordinary session of this Congregation, in the audience granted to the undersigned Cardinal Prefect and ordered its publication. Rome, at the seat of the Congregation for the Doctrine of the Faith, 26 November 1983. Freemasonry is considered the declared enemy of the Church. Her urgent goals include the suppression of the Church ch’s influence on people. In doing so, it concretely fights Catholic morality. The role of Freemasonry in the anti-Semitic incitement of the Enlightenment and in the French Revolution is well documented. The same applies to a great extent to their role in the nineteenth century in combating and destroying the Papal States. The high-grade freemason Giuseppe Mazzini (1805-1872), after whom the lodge no. 118 is named, is a telling example of the revolutionary spirit of the lodge brothers and their hostility towards the Church. In Genoa in 1827, he experienced his Masonic initiation. At the beginning of the 1830s, during his imprisonment in Savona, he was awarded the 32nd degree, which was a prerequisite for being admitted to the level of the "Highest Revenge" in the Carboneria secret society. In 1866 he was awarded the 33rd degree. At the same time he was admitted to the Supreme Council of the Scottish Rite. As a Republican and Antimonarchist, he also had to leave Italy, united in 1861, and lived in exile in London. In 1870, when the military struggle against the Papal State reached its final phase, he immediately returned to Italy and organized new unrest. Because of his rejection of the monarchy, he had to leave Italy again after the successful destruction of the Papal State. Shortly before his death in 1872, his Catholic sister tried to persuade him to do penance, to repent and return to the Church. He answered her, "I have no regrets." He died on March 10, 1872 without spiritual assistance under a false name in the mansion of a lodge brother and surrounded by leading Masons. Such a ritual not only happens as a farewell, but is intended to prevent the dying man from becoming "weak" on his death bed, and returning to the faith of the archenemy, the Church. More recently, several former Masons have left books offering a glimpse behind the scenes of the lodges. An illuminating insight, albeit dressed in a historical novel, is also offered in 2015 by the lawyer Norbert Nemeth, club director of the liberal parliamentary club in the Austrian National Council (comparable to the parliamentary executive director of a parliamentary group with the difference that the club director is not a member of parliament) entitled, "In the shadow of Gracchus". 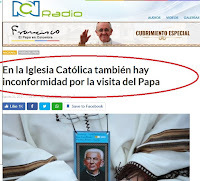 Because of the proximity of Bishop Rubén Lungone's SJ to Pope Francis, one can not expect a reaction from Rome to the unusual writing and the thus celebrated rapprochement between Church and lodge. Freemasonry, the mafia and Pope Francis as a prototype of the "enlightened despot" who was supposed to rule the "global society" because democracy was "not suitable". 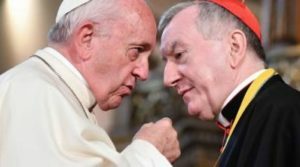 (Rome) What does a Grand Master of Freemasonry say about Pope Francis? A few days ago, the official website of the Grand Lodge of Italy (GLRI) published some Thoughts by Grandmaster Fabio Venzi. Even more enlightening seem to be words of his predecessor in the office of grandmaster. The main concern of Grand Master Venzi is to correct on 28 pages "enormous inaccuracies, contradictions and misstatements" in the recent report of the Anti-Mafia Committee of Inquiry of the Italian Parliament. The Parliamentary Committee of Inquiry had submitted it on 21 December 2017. The committee, which was in office until the parliamentary elections last March, was chaired by former Christian Democrat politician and Minister of Health, Rosy Bindi. In the Bindi report, among other things, is the revelation of the infiltration of some Masonic organizations by the mafia. On page 155 there is a brief paragraph on the incompatibility of the Catholic Church and Freemasonry, without giving the reasons for this incompatibility. It wasn’t the allegations of infiltration by the mafia, but this paragraph of eleven lines, that was addressed by Grand Master Vanzi. "This is undoubtedly the most troubling part" of the report (page 2). In his reply, the Grand Master claims a perfect compatibility between Church and lodge. Freemasonry is not plotting, the anti-masonry critics are absurd and slanderous in their statements (p.2ff) and probably suffer from a "dysphoria of personality" (p.26). "As I have already suggested, we know that hostility to Masonry was born before Freemasonry" (p. 25f). "Hostility to Freemasonry goes with Freemasonry" (p. 11). "Freemasonry was created in 1717. The first anti-Masonite document dates from 1652." So what !? There is considerable confusion in the statements of the Grand Master. When was the hostility to Freemasonry really born? Even he doesn't seem to be able to believe that it could have existed even before the founding of the Masons. The statements of the Grand Master, however, help to better understand the incompatibility between Church and lodge. In his remarks, the Grand Master clearly shows that Freemasonry is a "mystery school" with an "initiation rite", "one of the many esoteric movements" (p. 4). The Grand master, however, resolutely defends himself against the assertion of a "'Satanic' component of Freemasonry" (p. 5). On the other hand, he does not reject an initiatory, esoteric, gnostic and Luciferian component. 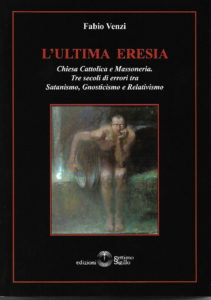 The title page of his already mentioned, most recent book "The Last Heresy" is at least adorned with the picture of the painting "Lucifer" by the German painter Franz von Stuck (1890). Conspiracy against the church? "Ridiculous…"
Freemasonry has conspired against the Church? Impossible, ridiculous, absurd, says Grand Master Venzi. He also describes it as "ridiculous" that he is supposed to have "important, clerical allies" and "contacts with high-ranking representatives in the Vatican" (page 3f). In the book "Masonic Vatican. 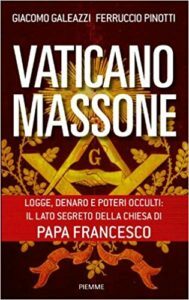 Lodges, money and occult power: The secret side of the Church of Pope Francis" (Vaticano Massone), published by the Vaticanist Giacomo Galeazzi in 2013 with his colleague Ferruccio Pinotti, sounds quite different. The two journalists also spoke with Grand Master Venzi. He "revealed to us that in his obedience, the only one recognized by the Grand Lodge of England, there are many priests. Venzi is in a sober and discreet way to begin a dialogue with representatives of the Vatican "(p. 54). "It is suggested by many that behind the recent and revolutionary events in the Vatican, especially the resignation of Pope Benedict XVI, is the hand of the lodges. In the corridors of the Sacri Palazzi it is whispered that even the election of the new Pope is their work. After a pontificate of closure like that of Ratzinger, it is probable that many among the lodge brothers hope, with the help of the Jesuit Bergoglio, to re-establish the old sympathies between the Society of Jesus and the Freemasons "(see also The Jesuit on the Pope's throne). "Do you know the 'Santa'?" Venzi denies in his "Thoughts" that the Masonic rituals are secret because "they are easy to find on numerous websites" (p. 13). However, he does not name such a website that could serve as a reliable source. 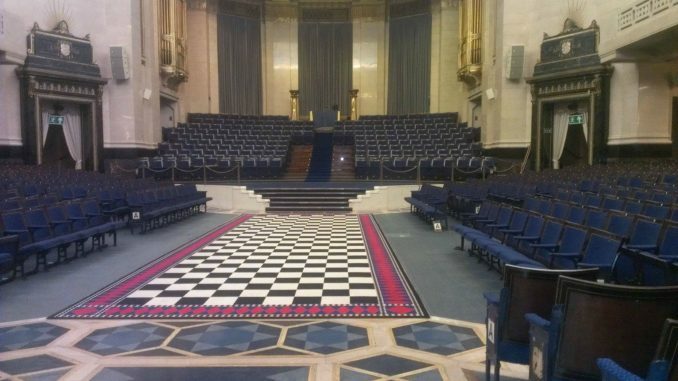 If the rituals of Freemasonry, its obedience or any other obedience are not secret, then why not publish them on the official site of the Grand Lodge? "Freemasonry can survive in the underground"
Grand Master Venzi is astonished that the Bindi report mentions a possible "dissolution of the societies" (p. 25) by the state. Cryptically, the Grand Master indicates that the Masons are capable of working in the underground in such a case. "Even if Italy forbade Freemasonry, it would still exist abroad, which could infiltrate it and rebuild it in Italy" (p. 25). In other words, the Grand Master indicates that a state ban can not shake a secret society with so much experience. The Bindi report also mentions Pope Francis, who in 2017 refused accreditation to the Holy See for a designated ambassador because of his membership in the lodge. 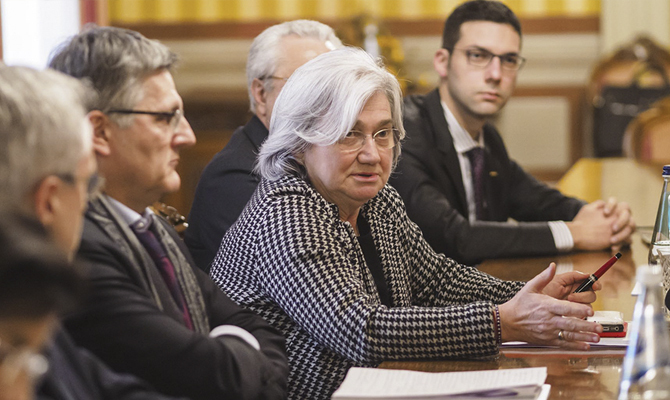 Apparently, the Grand Master is concerned that the Italian State could follow suit and remove the Freemasons from its diplomatic service among its ambassadors. But this danger does not seem to exist, for Bindi emphasized in her report that the Anti-Mafia Committee of Inquiry had "nothing to do with the phenomenon of Freemasonry itself", not even with Italian Freemasonry as a whole, but only with four obediences including the Grand Lodge (p. 91f). The Grand Master does not have to worry. The Italian state will not ban Freemasonry because every government would fear a massive national and international reaction from Freemasonry. In view of the Grandmaster's suggestion of contacts with high-ranking Church representatives, it would not be excluded that even there someone could tune into the choir in defense of the lodge brothers. Venzi also criticizes his predecessor, Grand Master Giuliano Di Bernardo (p. 24). Di Bernardo was Grand Master of the Grand Orient of Italy (1990-1993). As the Italian party system of the post-war period imploded under corruption charges (Christian Democracy, Socialist Party) and the collapse of the Eastern Bloc (Communist Party), and the Great Orient and its networking came into the spotlight, Di Bernardo sought safety, resigned and founded the Grand Lodge of Italy, whose grandmaster he became. The Grand Lodge was, in contrast to the Great Orient, recognized by the Grand Lodge of England. It was Di Bernardo who in 1999 brought the Mason Venzi into the Grand Lodge and presented him as his successor. Since 2001 Venzi is Grandmaster. 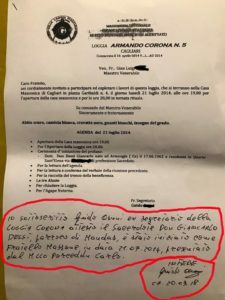 "The Grand Lodge of Italy, according to the report of the anti-mafia commission on the Great Orient, is most contaminated by infiltrations of the mafia and the 'Ndrangheta" (Min. 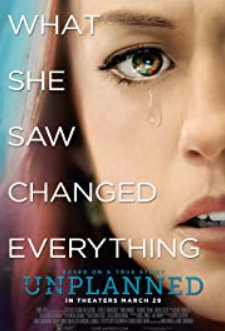 31: 50-32: 13) .2). "The Grand Lodge of Italy, which was the showpiece of Italian and English Freemasonry, was reduced to rubble by Fabio Venzi. I wonder how the Grand Lodge of England can continue to recognize her as the only Masonic obedience on Italian soil. Why does not Venzi come back? If Venzi leaves, perhaps someone else could return a minimum of dignity to what I call my Masonic creation "(Min 33: 23-34: 20). 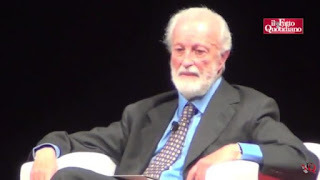 Far more interesting than these internal-lodge animosities is another statement by Di Bernardo, who was, after all, the grand master of Italy's two biggest obediences and internationally well-connected. Di Bernardo is convinced that "global society" can not be governed democratically, but only through "a community of wise men who embody the One, the enlightened tyrant" (Min. 40: 00-40: 47). But was it not Freemasonry, which in the 18th.-- 20th Centuries fought with particular determination against the ancien regime and against the monarchies (except the English) and for democracy? Did democracy serve only as an intermediate step to get rid of the old order? In an interview with the daily Libero on 22 February 2016, the former Grand Master praised Cardinal Secretary of State Pietro Parolin, the Vatican diplomat whom Pope Francis sent to the Vatican Secretariat of State in the Summer of 2013. Parolin attended an annnual convention of the Bilderbergers at the beginning of June as the first Secretary of State with the consent of Pope Francis. Libero: What is your prototype of an enlightened tyrant? Di Bernardo: If I really should name one, I would say: Pope Francis. 1. ↑ `Ndrangheta is called the Calabrian mafia, which consists of different clans (` Ndrine), which territorially divide Calabria, Italy and the foreign countries. The structure of ` Ndrangheta is very similar to Freemasonry. The membership is acquired through an initiation rite. At the top stands the 'Santa ', in which the memberships are again only possible under certain, already passed stages and according to hierarchical regulations. Similarly, there are degrees and special lodges in the lodges. The ' Santisti ', members of the ' Santa ', ritually call three "patron saints": Giuseppe Garibaldi, Giuseppe Mazzini and Alfonso La Marmora. All three were high-grade freemasons, Garibaldi even Grand Master of the Great Orient of Italy. (Paris) A new book on Freemasonry is causing some sensation in France. 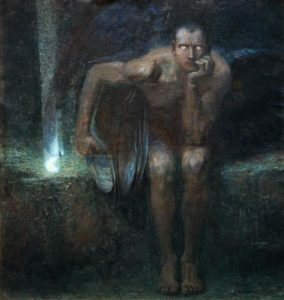 "Je servais Lucifer sans le savoir" (IServed Lucifer, Unknowingly) was presented by Serge Abad-Gallardo, who himself was a member and master of a Masonic lodge for 24 years. Freemasonry is very solicitous of the new "brothers". You will be welcomed with open arms. The lodge brothers are looking for answers about the meaning of life, about what holds the universe together. 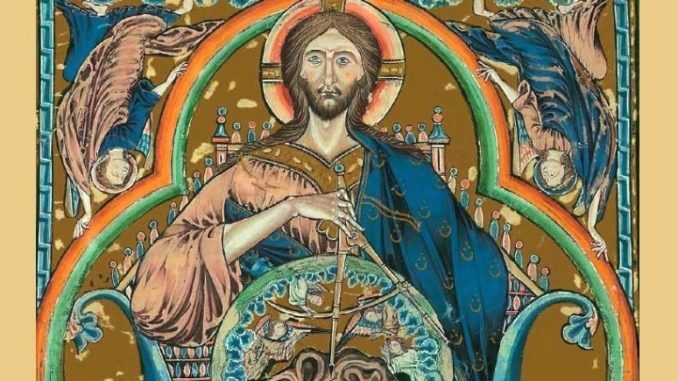 They do not seek these answers from Christ and the Church, while they seek autonomously because they seek a secret knowledge accessible only to the "initiate." This "secret knowledge" is supposed to lead them "to the light". This already makes clear its central feature, the rejection of Jesus Christ, who says of Himself: "I am the way and the truth and the life.” So as he seeks the truth elsewhere, he can not find the truth. Rather, he finds something quite different, all the more so because he consciously rejects the real truth, Christ. In contrast to the Church, whose answers are simple and understandable to everyone because they should be accessible to all, Freemasonry offers coded answers that have many meanings because they defend a "multi-faceted truth." Abad-Gallardo confirms that one can speak of "manipulation" in the lodges. Lucifer? "If you are looking for a bit, you will find ..."
But what justifies the book title with the clear allusion to Satan? "There are rituals that I have participated in, but that is not essential. It is essential what one does not see or does not read, but which is omnipresent between the lines. Masonic symbols implicitly refer to Lucifer. If you just search a bit, you will find these connections. " He found it quickly, but accepted it for a long time in an effort to gain exclusive knowledge. "I became aware of it very quickly, already at the apprentice level, so soon after the initiation, in the context of a ceremony that glorified Lucifer expressly. But I was told that this was not Lucifer, but in fact the bearer of light. Which is not quite wrong! " But wrong is the context. "It was not until much later, when I began to find the path of faith, that I began to ask many questions. At the ceremony, when I attained master's degree, the words 'Tubal Caïn' were whispered in my ear. A clear allusion to the satanic influence that occurs in most Masonic rites. " While the satanic allusions are hidden in some degrees, the very essence of Freemasonry is clearly visible in others. For example, according to Abad-Gallardo, in the 33rd degree of the Scottish Rite, the Freemason who attains the degree must use a dagger to stab a papal tiara. If he hesitates, he is told that this is not directed against the Church, but against Pope Clement V, who had exposed the Templar Order to the persecution by the French King, which allegedly has nothing to do with hostility to the Church. "Freemasonry is essentially luciferous in the sense of a Luciferian pride. No black masses are celebrated, at least as far as I know, but their goal is to inculcate the Freemason in the separation from God, which is directly involved with the fact that he is to feel himself as God by working himself up to the Divinity. In contrast to the Church, which defends the law of God, and natural law, Freemasonry confesses that there is no such law, but only a fluid, changing morality. It favors a new social order in which individual freedom prevails and the law is an expression of society without any reference to a fixed moral law or law. Relativism is the key to Masonic teaching. " Christian lodges "are a hoax"
Abad-Gallardo, who belonged to the Le Droit Humain, a branch of the Great Orient of France, also comments on the oft-asserted existence of "Christian lodges.” English Freemasonry, to which most lodges in German-speaking countries are obliged, is called Christian in contrast to Roman Freemasonry. "They are a hoax. Some lodges even say they are Christian to avoid having to explain they are Christian because the 'venerable master' breaks the bread and distributes it. It does not matter what name they wear, it is important to look at the rituals they practice, and they are all esoteric, and therefore occult. Everything that is occult, magical, clairvoyant is condemned from the Old Testament to St. Paul. Freemasonry has been condemned several times by the Catholic Church, but also by the Presbyterian Church of Scotland, and by the American and English Methodists. The Church is right in saying that the two paths of the Church and the lodge are antinomic, contradictory, and therefore incompatible. You can not serve two masters. These lodges call themselves Christian to attract Christians, but in reality they aim at the apostasy, the apostasy of believers from every religion, and especially the apostasy of those who are Catholic. When a Christian becomes a Mason, at the initiation rite, disavows, unknowingly, his baptism. The goal of Freemasonry of all obediences is the destruction of Christendom, especially the Catholic Church, to replace it with the Masonic religion and its dogmas." Abad-Gallardo also leaves no doubt about the influence of the Masons. The lodges are trying to downplay this influence and their role so as not to attract unwanted attention. The main thing is to control the image of the lodge in public. Serge Abad-Gallardo's book: Je servais Lucifer sans le savoir and J'ai frappé à la porte du Temple. Both have appeared at Éditions Pierre Téqui in Paris. (Rome) Is Pope Francis a Marxist? Or Communist? 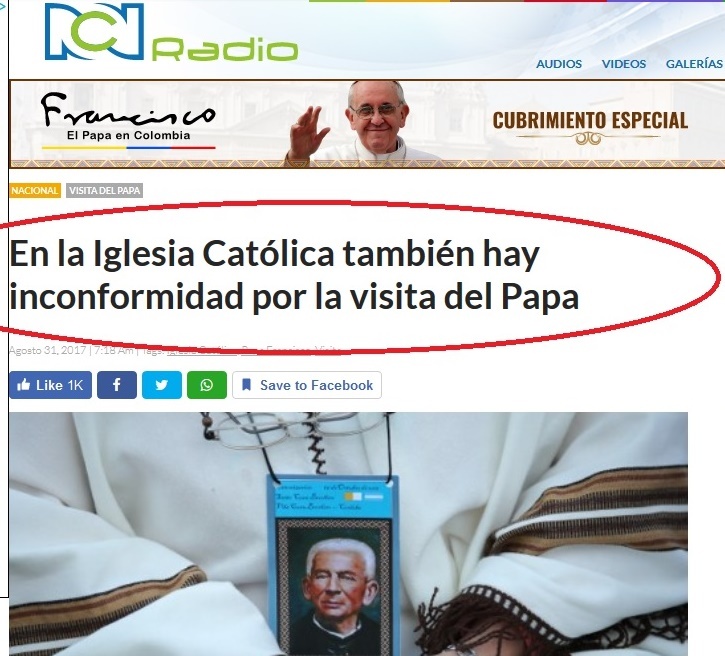 Who knows, but certainly he is a "revolutionary," as his friend and avowed atheist Eugenio Scalfari explained in the recent editorial of his La Repubblica, the only daily newspaper that is said to be regularly read by Francis. Questions about the pope's political convictions have cropped up since the pontificate began. The starting point was in autumn 2013 with the publication of Evangelii gaudium. At the time, critics in the United States called Francis a Marxist. Is the pope a Marxist? A communist? From the left side it was first mentioned particularly clearly in connection with the visit of the Greek Prime Minister Alexis Tsipras. "The Pope is not a leftist, but he talks like a leftist". On November 12, in Syracuse, a conference entitled "Church and Freemasonry - So close, So Far?" has taken place. It was organized by the Grand Orient of Italy. Speakers included the theologian Monsignor Maurizio Aliotta (Archbishopric of Syracuse), Msgr. Antonio Staglianò (Bishop of Noto), and Sergio Rosso and Santi Fedele, both grand dignitaries of the Grand Orient. The official reason was the 300th anniversary of the founding of Freemasonry in 1717. In an article in Avvenire, the daily newspaper of the Italian Episcopal Conference, the priest Ennio Stamile wrote that "despite the differences, it is good," genuine ways of serving the common good and the transparent and responsible use of social justice." So is it "a Catholic-Masonic co-operation on the level of social justice and solidarity?" is the question asked by Father Siano, who analyzed the four main addresses. (Rome) The Vatican has refused accreditation to the Lebanese ambassador to the Holy See for his membership in a Masonic lodge. 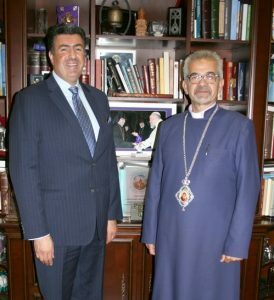 "I am a Mason, but not active"
Johnny Ibrahim, who currently serves as the Lebanese Consul General in Los Angeles, has been appointed Ambassador for the Holy See by his country's government. As the Vaticanist Franca Giansoldati reported yesterday, the reason his nomination was rejected by the Holy See attributed to his Freemasonry. Johnny Ibrahim is said to be associated with the Masonic Grand Orient of France. He himself confirmed his lodge members, but assures us that he is not active. This is similar to how Austrian President Alexander Van der Bellen explained himself last year. In three television debates, the two candidates of the Federal presidential ballot met each other. Each time his opponent confronted him with his lodge membership. Van der Bellen denied it twice, the third time he admitted it by saying that he had been active "only" for a few years, then ten years passively, and finally lapsed. The Grand Orient of France is one of the world's largest Masonic organizations. The refusal of accreditation for Ibrahim equals a renewed condemnation of Freemasonry. The lodges are celebrating their 300th anniversary this year. In 1717, the first Grand Lodge was built in London. A short time later, the Church pronounced the first condemnation because the worldview of the lodges was incompatible with Christianity. In recent decades, attempts have been made several times, especially in German-speaking countries, to lift the sentence. When the new Codex Iuris Canonici (CIC) was published in1983 and no explicit mention of Freemasonry was found in it, the matter was considered finished, the promoters of the Catholic-Mason reconciliation jubilated. Then came a damper. "If Your Holiness cancels the canonical ban on Masonry, the next conclave will look like a Lodge." Whether it actually happened that way can not be proven. The fact is that the then prefect of the Faith, Joseph Cardinal Ratzinger, made it clear in the same year that in relation to Freemasonry there is no change in the ecclesiastical position. Due to the change of canon law, a Catholic, anyone initiated in the lodge, no longer automatically incurs excommunication. Instead, the CIC Canon 1374 demands that a "just punishment" be imposed upon the declaration of a lodge membership. However, Cardinal Ratzinger made it clear that Catholics who belong to a Lodge are still not admitted to the sacraments, not because they are excommunicated, but because they are in a state of grave sin. The Lebanese government will have to nominate another diplomat for ambassador to the Holy See. Lebanon is the country with the largest proportion of Christians in the Middle East. a.) Anyone who joins Freemasonry automatically incurs excommunication, which is simpliciter reserved to the Apostolic See. The connection to Freemasonry is that one can be registered as a member. A special rite for reception is not required to incite excommunication. It is also not necessary for someone to take part in the Masonic meetings. A freemason who wants to reconcile himself to the Church can only obtain the acquittal if he is completely separated from Freemasonry and removed from the membership list. He also has to promise never to pay a contribution, nor to participate in meetings of the lodge brothers. As far as possible, such a freemason must hand over all badges, books and documents to the ecclesiastical superior or his delegate. Furthermore, he must also make reparation for the offense as much as possible. (b) The same punishment as the Freemasons fall into those who join a similar union which fights or agitates against the Church or the legitimate state power. Because it must be an association similar to that of Freemasonry, the organization (but not the members) must be secret, as the members must observe silence about the structure, purpose, and means of the association. It is not, however, required that they should commit themselves by an oath. An organization fights against the powers of the state if, like the nihilists and anarchists, they want to eliminate any state authority or even to eliminate the existing state form, by revolution. But it does not belong here to the political parties who want to gain political power by law and then to change the state form. - It remains the same whether the association mentioned publicly or secretly to agitate against or strangle the Church or state. Canon 2335 CIC, quoted from P. Heribert Jone OFM Cap . : Book of Canon Law. Explanation of canons, III. Vol. Litigation and Criminal Law. 1940, Paderborn.